This is a one of a kind in the USA, the 4 lane double Helix obstacle course brings more fun for more people. A fast pace course going up and crossing over twice 4 people can race at a time. 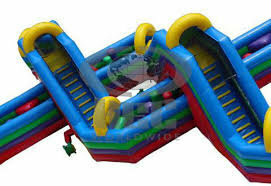 It's over 50 feet long and can be connected to many of our other courses to make a 4 lane inflatable obstacle course over 180 feet long.